The day before yesterday, The Washington Post ran a piece with the alarming headline, “The middle class is shrinking just about everywhere in America.” Although you wouldn’t know it from the first few paragraphs, a shrinking middle class isn’t necessarily a bad thing. As HumanProgress.org Advisory Board member Mark Perry has pointed out, America’s middle class is disappearing primarily because people are moving into higher income groups, not falling into poverty. Data from the U.S. Census Bureau shows that after adjusting for inflation, households with an annual income of $100,000 or more rose from a mere 8% of households in 1967 to a quarter of households in 2014. According to the Pew Research Center, 11% fewer Americans were middle class in 2015 than in 1971, because 7% moved into higher income groups and 4% moved into lower income groups. 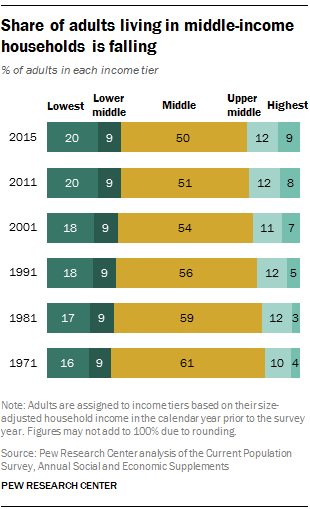 The share of Americans in the upper middle and highest income tiers rose from 14% in 1971 to 21% in 2015. Other cities with a shrinking middle class, a growing upper class and very little change in the lower class include New York, San Francisco and New Orleans. So the next time you hear someone bemoan the “shrinking middle class,” take a closer look at the data and keep in mind that it may actually be a sign of growing prosperity. Middle-income household income increased by 13% in the 1970s, 11% in the 1980s, and 12% in the 1990s. Lower-income households had gains of 13% in the 1970s, 8% in the 1980s and 15% in the 1990s. Upper-income households registered a 10% gain in the 1970s [and] 18% in both the 1980s and 1990s. One of the direct results of the Federal Reserve’s zero interest rate policies has been a massive reduction in interest income going to households. Since 2008, household interest income has fallen by about $400 billion annually. That’s $400 billion each year that families have not had to spend. Now of course you can also argue that families interest expenses have also fallen, and that would be true, but that just serves to illustrate that much of monetary policy is not about creating wealth, but re-distributing it. Since interest payments are one’s person expense and another’s income, Fed driven changes in the interest rate should not increase household income in the aggregate. As interest income/expense is not the only item on the household balance sheet, the Fed does try to make us feel richer via changes in asset prices. The problem, however, is that the change in many asset prices can also have little more than distributional effects. If owners feel richer because their house prices have gone up, or not fallen as much as they would have otherwise, then renters are poorer as they need to save more to by the same house. The same holds for commodity prices. Monetary driven increases in the price of food might be great for farmers, or speculators, but it makes households poorer by the same amount it increases the wealth of commodity holders. If the Fed truly wished to help our economy get back to “normal” then it would allow the free choices of individual borrowers and savers to determine the interest rate. It would also end its implicit practice of picking winners and losers in our economy. Unlike Fed driven changes in asset prices and interest payments, voluntary exchange between savers and borrowers increases the welfare of all parties involved.